1. Candidate must possess the qualification: BE/Tech or Equivalent in Civil Engineering for JTO (Civil) and Electrical Engineering for JTO (Elect.) from a recognized Institute/ University and are required to appear in GATE Exam 2019. 2. 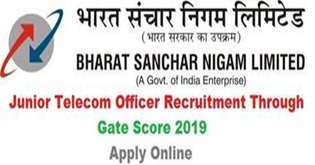 Candidates who wish to apply for BSNL JTO Recruitment 2019 must have a gate registration ID of 13 digits. Upper age relaxation is applicable as per Govt Norms. BSNL Junior Telecom Officer (JTO) Online Form through Gate Score 2019 is the Best opportunity for Graduate Engineers. There are total 198 vacancies available for JTO (Junior Telecom Officer) posts. BSNL Recruitment for JTO (Civil & Electrical) is to be done through Gate Score 2019. We have advised candidates to read the notification carefully before filling the application form.